Publication | Development of Return Period Stillwater Floodplains for the Northern Gulf of Mexico under the Coastal Dynamics of Sea Level Rise – Matthew V. Bilskie, Ph.D.
M.V. Bilskie, S.C. Hagen, J. Irish (2018). “Development of return period stillwater floodplains for the northern Gulf of Mexico under the coastal dynamics of sea level rise.” ASCE Journal of Waterway, Port, Coastal, and Ocean Engineering, 145(2), https://doi.org/10.1061/(ASCE)WW.1943-5460.0000468. 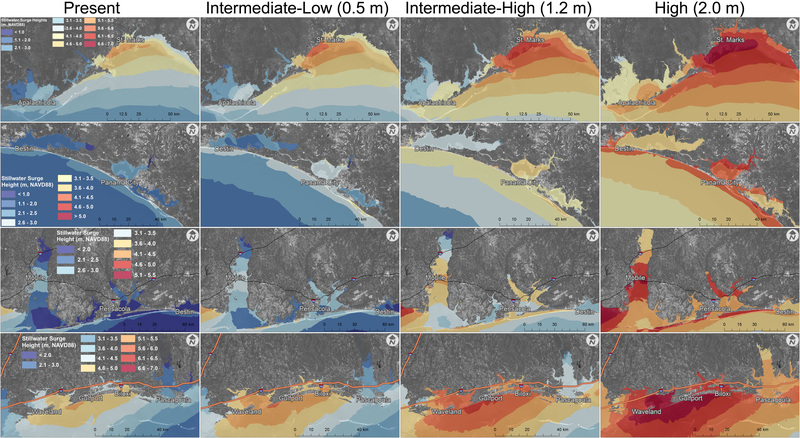 Abstract Rising seas increase the exposure, vulnerability, and thus the risk associated with hurricane storm surge flooding across the coastal floodplain. A methodology is applied to down select a suite of synthetic storms from recent flood insurance studies. The purpose is to force wind-wave and hurricane storm surge models of the northern Gulf of Mexico (NGOM) coast (Mississippi, Alabama, and the Florida Panhandle) that represent the future landscape and derive the 1 and 0.2% annual chance floodplain for present-day and four sea-level-rise (SLR) scenarios. Vast new regions become part of the 100-year floodplain by the end of the century. In Mississippi, the present-day 500-year return period event is likely to be the 100-year event under an SLR of 1.2 m. Throughout most of Alabama and the Florida Panhandle, the present-day 500-year return period event becomes a 100-year event with just 0.5 m of SLR. 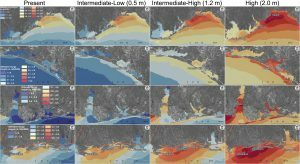 Results indicate the need to apply a coastal dynamic modeling approach to plan and prepare for the effects of SLR across the NGOM and other low-gradient coastal landscapes.